The formation of the Norbertine identity within a man is a spirit-led process of growth and discernment as he discovers himself more fully in his relationship to God and the community. The process begins with an initial inquiry, which is followed by a formal postulancy and then official entrance into the community. A two-year novitiate followed by three years of simple vows comprises the initial formation processes, culminating in the profession of solemn vows, which fully incorporates the man within the Norbertine community for life. Parallel to the spiritual formation is ministerial formation. Norbertine men can either be ordained priests or remain as solemnly professed brothers. The particular ministerial path is prayerfully discerned within the context of community through the individual’s sense of vocation to which he feels he is called. Theological education and professional ministerial preparation are also key components of a man’s formation for a life within the Norbertine community. The inquirer is an individual who has begun a process of discerning whether he is called to serve the Church as a religious priest or brother.The Norbertine Community welcomes men who wish to discern a possible vocation to our way of life. We also would welcome prospective candidates to join us for prayer, meals and conversation to get to know each other better. If a man in discernment feels particularly drawn to Norbertine life, he can further this process with the community by requesting to become a postulant. Postulancy is the first stage of formation. The postulant is expected to live with the Norbertine Community to become familiar with and develop a deeper understanding of our way of life and ministries. He can still remain engaged in his general life activites as far as school or work. This offers men in discernment the opportunity to enter a more formal relationship with the community while not having to completely leave their current life context. The postulancy is a time to explore what is believed to be a call to a deeper commitment without having to take the risk of long-term commitments. It is an opportunity to gradually engage in the context of consecrated life. In general, the postulancy lasts from three months to two years. Eventually, the individual and the community together arrive at a decision of whether or not the postulant will formally enter the community as a novice. When a man enters the novitiate he receives the Norbertine Habit and is expected to live in accordance with the vows of our community, though he is not formally bound by them. The novitiate is a time of intensive discernment, spiritual and human formation, and growth. The first year novitiate focuses on the inner life of the novice and spiritual development. The second year novitiate begins ministerial formation and experience in balancing the “vita mixta” or our way of life. The character of the first year novitiate is more experiential than academic, including a program of seminars and communal activities centered on prayer, contemplation, spirituality, liturgy, manual work, community involvement and the history and tradition of Norbertine religious life. An initial “hermitage” period of ascetic withdrawal from pursuits, responsibilities and distractions outside of the community characterizes the first few months of the novitiate, a quiet time during which the novice seeks to deepen his interior life. Each novice will make a directed retreat after his first year. An annual retreat is required of all men in initial formation. The same general values and goals apply to the second year novitiate as to the first. Discernment continues as primary focus, but with an even greater emphasis on one’s calling to the Norbertine Community and way of life. The second year novitiate directs the novice into a fuller participation and understanding of the Norbertine community and its mission. During the second year, novices may engage in a limited apostolic activity, i.e. ministry in a Norbertine parish, educational institution or hospital.The nature of the apostolic activity depends upon the novice’s background and particular experience. If the Norbertine community and the novice mutually discern that the novice’s relationship with the community is to continue and deepen, he is invited officially to request simple vows. The period of simple profession (commonly referred to as the “juniorate”) extends a minimum three years, but renewable up to six. After taking simple vows, the junior member commences formal theological study. Catholic Theological Union in Chicago, the largest Roman Catholic theologate in the United States, serves both lay and religious students (women and men) from many different countries and is the official theological school for Norbertines of the Daylesford, De Pere and Santa Maria de la Vid Abbeys. Residence for Norbertines is at Holy Spirit House of Studies. At the conclusion of the period of simple vows, and if the junior and the community together discern that the junior is called to a permanent relationship with the Norbertine community, he is invited to request solemn vows, which represents full incorporation within the canonry and Order. Solemn profession is when a man gives himself fully to the life of the community and service of the Church seeking to be of one heart and one mind with others on the journey into God. 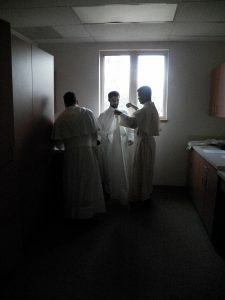 After solemn profession and near the conclusion of theological studies, the Norbertine student will dialogue with the Abbot and the Abbot’s Council to further discern where and in what capacity the Norbertine will minister, considering together his individual talents as well as the needs of both the Norbertine and the wider Church community. If the solemnly professed member is a candidate for the presbyterate, he may then apply for Holy Orders. 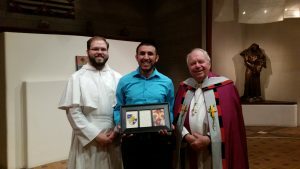 After ordination to the diaconate, the Norbertine deacon will engage in a diaconate internship of six months to a year, generally in a parish, to continue to grow and gain experience in pastoral and liturgical ministries. Following the conclusion of this diaconate period, the deacon is ordained to the presbyterate.